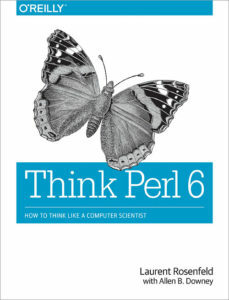 Order Think Perl 6 from Amazon.com. Download Think Perl 6 in PDF. Read the Spanish translation of Think Perl 6. Think Perl 6 is an introduction to computer science and programming intended for people with little or no experience. This aim of this book is not primarily to teach Perl 6, but instead to teach the art of programming, using the Perl 6 language. After having completed this book, you should hopefully be able to write programs to solve relatively difficult problems in Perl 6, but my main aim is to teach computer science, software programming, and problem solving rather than solely to teach the Perl 6 language itself. Think Perl 6 is a free book available under the Creative Commons Attribution-NonCommercial-ShareAlike 3.0 Unported License . Readers are free to copy and distribute the text; they are also free to modify it, which allows them to adapt the book to different needs, and to help develop new material. The LaTeX source for this book is in this repository.